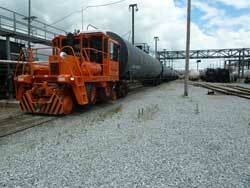 Shelby Railroad Service, Inc. sells, installs and services Control Chief Remote Control Systems. Remote controls for all makes of rail car movers, Rail King, Trackmobile and Shuttlewagon can be installed in both new and used models. Remote control systems increase team efficiency for connection and disconnection of cars. This offers the operator increased visibility since they can see farther down the train length. Switching is efficient, with fewer crewmembers. If your company uses the rail for off loading hoppers, you can use the off loading crew for Rail Car Mover operators as well. The controls are integrated without sacrificing ergonomics, legroom or visibility of the operator. Also, crewmembers receive on-site training for the base unit and the remote control. If you have a Rail King, Trackmobile or a Shuttlewagon, we are your place for Remote Control Systems.